The Antiquities Coalition is launching our first video series! Titled, “Culture Under Threat: Terrorism and Profiteering,” it features international experts offering solutions to and analysis of the looting crisis, illicit antiquities trade, and its connection to terrorism. The series is premiering today on the Antiquities Coalition’s website at theantiquitiescoalition.org. and terrorist financing. Ministers from ten Middle East and North African countries, international experts, and our co-hosts from the Middle East Institute, UNESCO, and the Arab Republic of Egypt convened to seek solutions and discuss implementation of a comprehensive plan to confront the depredations caused by terrorist and criminal syndicates across the MENA region. The result was the Cairo Declaration, an agreement signed by all ten countries that commits them to a joint effort to stop terrorist funding and cultural destruction. 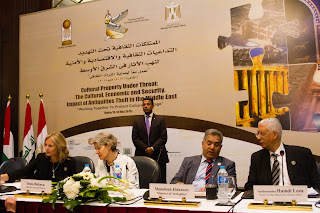 The “Culture Under Threat” videos were shot at the Cairo conference and feature top international experts, including UNESCO Director General Irina Bokova, Egyptian Minister of Antiquities Mamdouh Eldmaty, and Antiquities Coalition Chair Deborah Lehr. The series begins with Iraqi Minister of Tourism and Antiquities, Adel Fahad Shershab, who puts the crisis in a global context, reminding the world that an international response is required to help Iraq stop the threat from the so-called Islamic State. The Antiquities Coalition will publish new videos in the series weekly to our website and YouTube channel. To subscribe to this free series — and be kept informed of upcoming Antiquities Coalition events — please email CultureUnderThreat@theAntiquitiesCoalition.org.